Hyper Island is ruled by its own rights. The 10 major principles here are the source of its success. The learning process is based on preparing projects in teams and multidisciplinary thinking is promoted. one of the school founders. Make the learners responsible for their own learning. Learn in groups. Provide resources, support, encouragement and "scaffolding" for learners. Build learning around a series of large realistic projects in which groups construct solutions to sizeable problems. Bring in industry, academic and international experts to stimulate the learners. Use experts from a wide range of disciplines including some from outside the core curriculum areas (such as architects, town planners and industrial designers) to illustrate how things are done elsewhere. Make technology transparent. Immerse the students in a technology rich environment. Teach general IT principles and expect students to master tools and techniques on their own but with the support of structured assignments. Encourage the formation of a learning network in which students help each other and become confident experts and colleagues. Help develop problem solving strategies and research techniques. 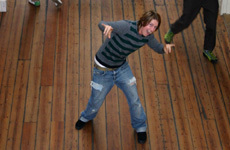 Encourage contact between students from different year groups and between students and lecturers on an ongoing basis. Develop critical skills by promoting criticism and review of each other's work. Explore quality, ethical, business and social values through discussion of the impact of projects on individuals, communities and industries. Give students the main responsibility for the marketing, promotion and reputation of the School. Build confident, effective communicators through regular presentations and feedback. 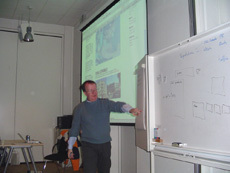 Link studying at the School to a period of professional practice in industry. Maintain the learner network during this Internship and after graduation. Set high standards for written, examination and creative work and provide feedback, enabling students to learn from mistakes and to improve work. Establish clear learning objectives for each module or project and develop clear criteria for all assessment. Review and evolve the education to reflect changing industry, technology and business needs. Involve students, graduates and lectures in the development of the course. 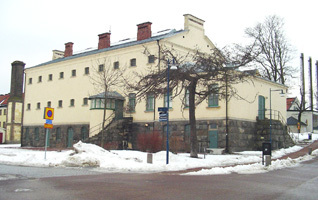 new media design school in Karlskrona, Sweden. 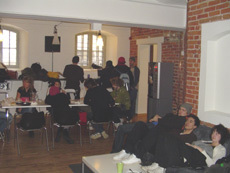 In 1996, a group of multimedia fanatics joined a Swedish government initiative, which was looking for private companies that would offer professional courses in new media. David Erixon, Lars Lundth and Jonathan Briggs from London based company the OTHER media grasped this moment and created a brand new type of school. The initiative is located on a tiny island Stumholmen, near the centre of Karlskrona. 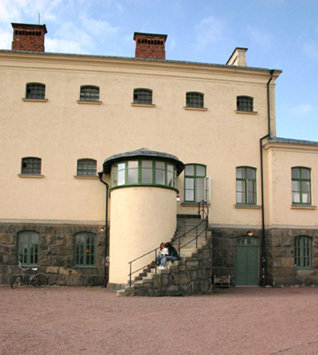 The school building used to be a Swedish royal marine prison, whose existence lost sense after the fall of the Berlin Wall and was looking for a new purpose. 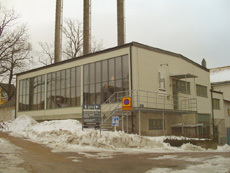 It was Lars Lundth who realized the potential of the place, bought the building and renovated it. The school building has not lost its prison character. The small cells were turned into workspaces while heavy locks gave way to magnetic cards readers. Students are content with the cold, thick walls and widow view checked with bars. They claim that it allows to concentrate on the task, to avoid distracting their creativity and is a perfect environment for the badger designers who feel most comfortable in a burrow. Various nationalities and characters mingle together on the school corridors. Many people came here from abroad, not discouraged even by the fact that one of the requirements is to learn Swedish. They all have different interests. There is also a considerable age difference between them. The youngest student is 19, the oldest 30. But they share one thing, which is passion. Oh, and there's the other: stripy clothes. It's hard to say weather it is due to the designers taste or influence of the prison climate. Each year the students make up a different crew. One of the most important projects during the course is creating the crew website. Its main objective is to present the students to companies that may take them on internship. The current team, Crew 11 , has just finished working on site www.crew11.net. Its official premiere took place on a release party on the 2nd March in Stockholm. You can still find the previous crews' sites on the internet: www.crew10.net, www.crew9.net as well as the others. Everyone here works non-stop and no one fed up. The students however must prove creative also after hours as Karlskrona is one of those horribly modest and quiet places. There are 60 000 inhabitants there, but the population is not dense as it is located on several islands. It has got a baroque architecture and a harbor that is enlisted on UNESCO List of World Cultural Heritage, but the night life is close to none. The students take care of their own progress. They are given frame knowledge and the access to all the means they need. They take part in meetings with international professionals and academic experts. The school stimulates creating a network of education where students help each other; there are people interested in graphic design, programming and management of projects - they all need to learn to communicate and cooperate while working on a project. The projects are assigned individually and there is no stiff syllabus. However, they are always realistic and force students to cope with real problems. During the 90-week new media design course students complete 14 modules. At the beginning, the projects go for general development, such as generating ideas, developing communicational skills and visual communication. After a few months time comes for more specialized modules. The students are to choose between technology, design and management. One of the last modules is a 30-week long training. The best students go to the leading studios all over the world. Half of the students wish to go to the USA, while the others plan to stay in Europe or go somewhere warm. You can find the list of the companies that that took the Hyper Island students on probation on the school website. Many of the students were employed by the studios they were trained at. Throughout the course, the students work in an environment rich in various technologies, but at the same time it is technologically neutral. The school teaches the basics of IT and requires from the students that they will learn the techniques they need on they own, only supported by professionals. The technology is transparent. Crew 11 is the 2005 class at Hyper Island . I had a chat with a few of them on a lunch break. 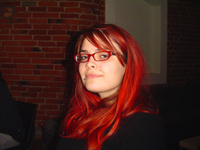 She comes from Åland Islands, an autonomous Baltic archipelago administrated by Finland. Swedish is the official language there so she didn't have any problems with it. Before coming to the Hyper Island she was studying Latin. What she likes about the school is that the students have a lot of influence on choosing the lecturers. She herself prefers meetings with specialists in the field to ordinary lectures. She plans to do her internship somewhere in Europe or Australia. She comes from Finland, where she gained BA in Arts. 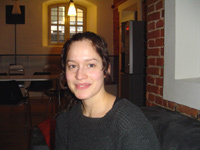 She lives in Denmark and she comes back home every week because she cannot stand the quietness of Karlskrona. She would like to go on training to Berlin. He was born in Sweden. He's been programming since he was 12 but he does not have any university education yet. What he does is learning by doing. He likes working as a flash developer and he belongs to the minority of the more technical students at the Hyper Island . He enjoys sharing his knowledge with others. He thinks about doing the internship in NY, LA or Spain and staying there afterwards. Born in Sweden, he used to study new media, graphic design and 3D design. He likes the diversity between the students and the fact that you can learn something from each of them. His dream place for internship should have many leading companies (NY) or be hot (Hawaii, Australia, Spain). 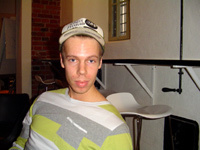 He claims that the calmness (sometimes reaching the level of boredom) in Karlskrona helps in learning. That might be the secret of Swedish design - the Swedes spend a lot of time indoors, not outdoors. She was born in Sweden. Before she came here she was studying digital media design. She's certain that the major virtue of the Hyper Island is the mixture of different people that you meet here. She likes the fact that there are virtually no teachers there - only co-workers who help by sharing their knowledge and experience. 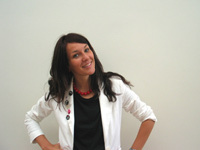 She's sure that the Hyper Island diploma is much more important that a scientific degree in design. She would like to have her project management internship in NY. Sverker and Christian noticed that the students at the Hyper Island have been changing every year. 10 years ago, when the school was launched everyone was just discovering Photoshop and instead interactive websites they were creating presentations on CD-ROM. Today technology is transparent. It is only a tool, not a value in itself. He's one of the first students to graduate from the Hyper Island . He was a member of the Crew 1 . He started working at the Hyper Island in 2002 after being a project manager at Icon Medialab , Out There Communications and Abel & Baker in Stockholm. He is responsible for Business and Management modules as well as marketing and promotion of the Hyper Island . 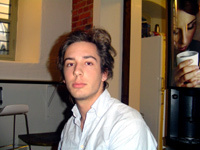 He graduated from the Hyper Island on 2001 as a member of Crew 5 . After that he left for Copenhagen, later he was involved in launching IPKO Institute in Kosovo. It was amazing to build a new technology school in a city coming back to life just after the war he says. He has been working with the Hyper Island students since 2004. According to what they say, the role of the Hyper Island is to create a certain consciousness. The school workers are happy about the HI inspiring others to create similar places. A new branch is due to be launched in autumn 2007, probably in Barcelona. English is going to be the language of instruction there.